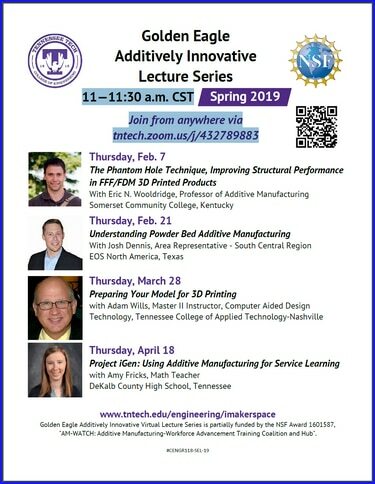 For the last several years, the Engineering Department at Tennessee Tech University (TTU) has created and hosted the Golden Eagle Additively Innovative Lecture Series. Dr. Ismail Fidan finds timely topics and the experts who can share about them for the virtual seminars. The Spring 2019 series begins in early February and here are the details. Students, teachers, and interested participants are welcome to join in from 11 to 11:30 a.m. CST. With a web browser, you can join from anywhere via this Zoom (web conferencing) link. Thursday, Feb. 7: The Phantom Hole Technique, Improving Structural Performance in FFF/FDM 3D Printed Products with Eric N. Wooldridge, Professor of Additive Manufacturing at Somerset Community College, Kentucky. Thursday, Feb. 21: Understanding Powder Bed Additive Manufacturing with Josh Dennis, Area Representative – South Central Region, Texas, EOS North America. We have written about the other Golden Eagle series events and you can learn more about them or watch/listen to previous talks by visiting the post: Additively Innovative Lecture Series At TTU – FALL 2018 where there are links to the past presentations (over two dozen presentations are archived). Golden Eagle Additively Innovative Virtual Lecture Series is partially funded by the NSF Award 1601587, “AM-WATCH: Additive Manufacturing-Workforce Advancement Training Coalition and Hub”.